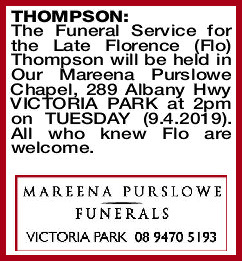 The Funeral Service for the Late Florence (Flo) Thompson will be held in Our Mareena Purslowe Chapel, 289 Albany Hwy VICTORIA PARK at 2pm on TUESDAY (9.4.2019). All who knew Flo are welcome. 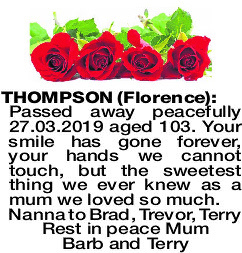 THOMPSON FLORENCE Passed away peacefully 27.03.2019 aged 103. 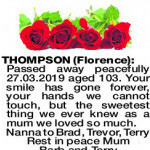 Your smile has gone forever, your hands we cannot touch, but the sweetest thing we ever knew as a mum we loved so much. 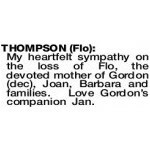 My heartfelt sympathy on the loss of Flo, the devoted mother of Gordon (dec), Joan, Barbara and families. Love Gordon's companion Jan.